Bullies in pulpits. Bullies in schools. Bullies on Twitter. Bullies in the news. Enough of that kind of bull. What the world needs now is Ferdinand, sweet Ferdinand, a rare breed of bovine who takes a stand against aggression, competitive rivalry and conforming to the expectations of others. Fox’s ‘toon factory Blue Sky is often more of a stealth player when it comes to touting its family films as opposed to the chest thumping that Disney and DreamWorks embrace. But lowered expectations aren’t a bad thing at times. That is why “Ferdinand” comes as a mostly pleasant surprise in a year that has produced a lack of stellar animated outings and stands in stark contrast to less savory aspects of “The Boss Baby” and “The LEGO Batman Movie.” Yes, there is padding afoot in the plotting, including a group dance-off, a too-long chase through a crowded city as well as an excess of chatty critters. But instead of being crude and rude, director Carlos Saldanha—a veteran of the “Ice Age” franchise whose “Rio” films were love letters to his native Brazil—and his writing team chose to extol such virtues as respect for others, teamwork, kindness and following your dream even if you are being coerced to do otherwise. When we first meet Ferdinand as a calf, he doesn’t join in the macho games and trash talk enjoyed by his corral companions. He’d rather nurture a pretty carnation that has sprouted in their training pen than brag about his future prowess in the ring. 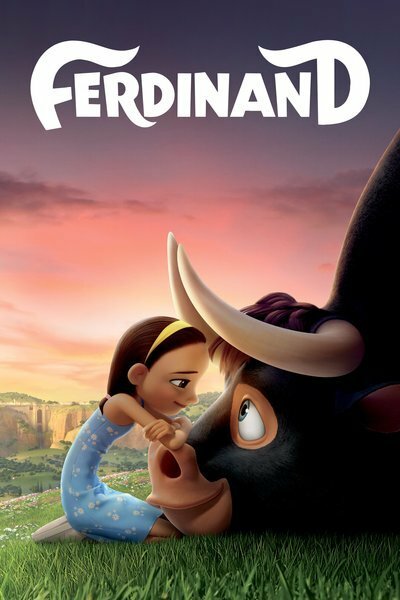 But when his father fails to return after being picked to face a matador, Ferdinand runs away and finds himself on a farm awash in fragrant buds and becomes a pet to Nina, a young girl who lives there with her dad. As in the source material, Ferdinand grows to immense proportions yet maintains his docile nature. But a run-in with a bee causes him to become atypically ferocious and he is sent back to train with his old buddies. He is assigned a wonky-toothed, googly-eyed calming goat named Lupe (Kate McKinnon, a stitch in hyper sidekick mode) who coaches the grown-up Ferdinand (infectiously voiced by wrestling superstar John Cena) in the art of the fight. But her heavyweight contender has no interest in charging at a red cape, especially after he figures out that a bull either ends up going to the “chop shop”—a rather terrifying meat factory that is bluntly dealt with—or is sacrificed for the sake of blood sport in the ring. It’s the opposite of a win-win. But that doesn’t prevent Ferdinand from being selected as a worthy opponent by the revered matador El Primero (Miguel Angel Silvestre) for his farewell appearance in the arena and puts his resistance to the test. I also admired whoever chose such an eclectic quartet of actors to speak for Ferdinand’s bullring buddies: Bobby Cannavale as brutish Valiente, Anthony Anderson as skinny Bones, football legend Peyton Manning as skittish Guapo and David Tennant of “Doctor Who” fame as Angus, who hails from the Scottish highlands. But what is truly amazing about this film is how thoughtfully “Ferdinand” questions male gender expectations, considering the form of the message also showcases a trio of goofy hedgehogs named Una (Gina Rodriguez), Dos (Daveed Diggs) and Cuatro (Gabriel Iglesias).